Increase your consistency and production capacity while lowering your operating costs with the AC Horn Manufacturing Single Lane Collator. Designed with the operator in mind, these systems are manufactured for operator comfort, by minimizing labor requirements and reducing the stresses normally associated with case packing. 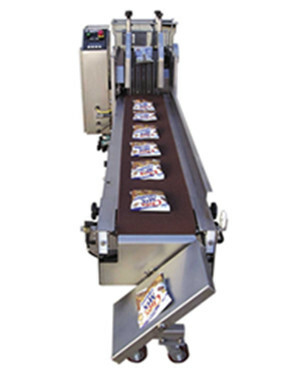 The Single Lane Collator accepts bags from the packaging machine, gently conveying them into a collating conveyor. The collator then aligns the bags for easy packing. The collator can also count and group the bags to your case configuration.